After releasing track after track from their debut self-titled album, Sleeptalk is nearly ready for a full-on record release. The electro-pop quintet hails from the San Fernando Valley and recently signed with Artery Recordings to premiere their full-length album. Prior to their self-titled, they released two EPS titled Pure and Young. The first single released from their debut album was “Indio, CA”, a tribute to the legendary Coachella Music Festival that takes place in Indio every year. Fitzpatrick attends Coachella every year and describes those experiences with a mix of love song and power anthem through sincerity in both lyrics and instruments. “Love” is one of the more pop tracks and was the best follow-up to “Indio, CA”. Released on Valentine’s Day, “Love” embarks on being lost in a relationship and both sides being unsure of how the other feels – but each person still knows that the other is someone they can count on. Accompanying the track is a visual component created by photographer Brandon Walford that is simple but easily adds a powerful element to the song. Although “Young” was released on their EP in 2015, it is also the fourth track on their LP. The main story is about one of those nights that go by so quickly that suddenly the sun is coming up. The theme of “Young” coincides with the theme of the record and the teenage-angst feel that each song creates. “Strange Nights” is easily the most striking song on the album, keeping that teenage angst vibe and sharing Fitzpatrick’s journey of times when he would do anything just for the thrill of it all. It’s a story of being young and in love and coming to the realization that there needs to be a moment when growing up is mandatory. 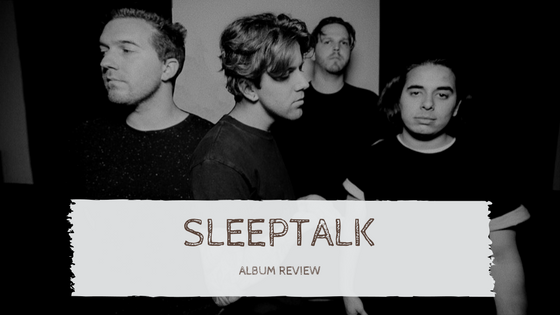 From beginning to end, Sleeptalk’s self-titled is the perfect blend of electronic pop that tells substantial stories while being an all-around good listen. The album is available July 28th.